Interests:1. Changes in Battalion organization and training. 2. The development of tactics, techniques and procedures through the Great War. 3. The last 100 days. 4. Uniforms/equipment of the AIF. That's the first confirmed WW2 SRD I've seen. Most seem to be undated, thought I have one dated 1917. First time I've seen a WW2 Pearson. A better mark than the WW1 variety. Many of which seem to be smeared on with the stamp very unevenly. This topic could well become a definitive SRD discussion. 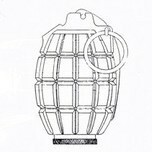 Can anyone list the proven contents of SRD jars other than the usual rum, ink etc? Thanks for that. I never could read it. Now I know the maker. I thought after my googling that that James Pearson Limited were renamed Pearson & Co in 1922. Did their markings change, or have I got it wrong, which is quite possible. We may well have the answer, you heard it on the forum first. I realise this is a bit of an aside to your original post, but the mention of Skey-Tamworth caught my eye. 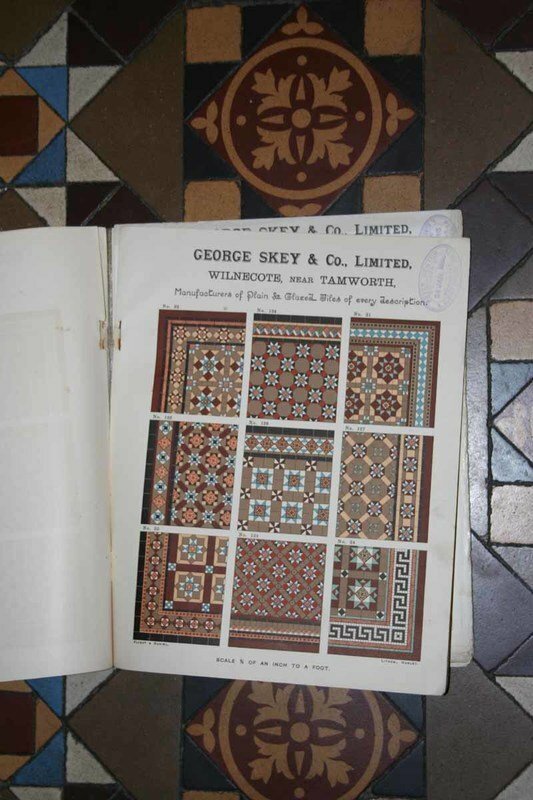 I thought you would like to see a copy of a page from George Skey and Co Ltd 1896 catalogue of tiles for hall floors, photographed this evening on my own hall floor! Given the year, it is an extraordinarily extravagant colour catalogue. I also have their standard pipe list for 1901 showing that they made a full range of stoneware drain pipes, chimney tops, flue linings, fire bricks, sanitary closets, sinks, channels and blue bricks. Skey made a wide variety of things. 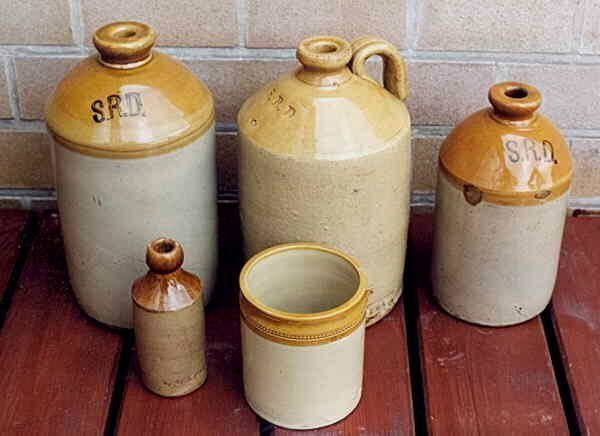 Founded in 1862 they made Ornamental Wares, Terra Cotta (including your tiles) and Stonewares (including SRD's). They always used impressed marks and I expect your floor tiles may each be marked on the back (don't dig up the floor the check). I disagree about the extravagance of the designs. This was pretty standard for the late Victorian time and the fact that they would have also exported to France, then deep into it's Belle Epoque phase where houses were covered with bright tiles inside and out. I think later carpet designs copied many of these patterns when carpet became for fashionable. Great to own that catalogue and the tiles. 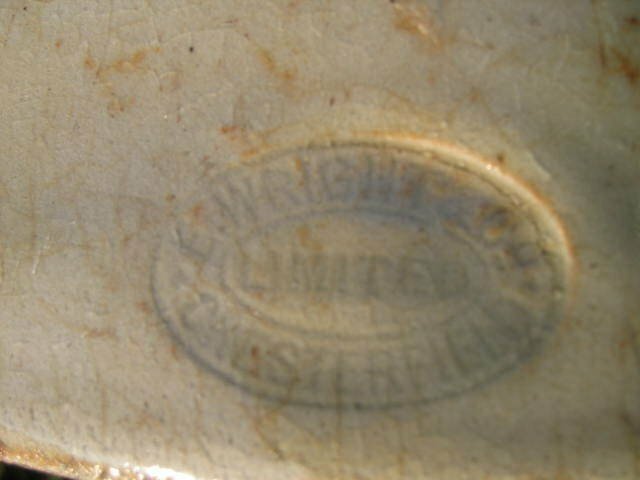 Pearson's, like many pottery factories changed their marks regularly over the years. 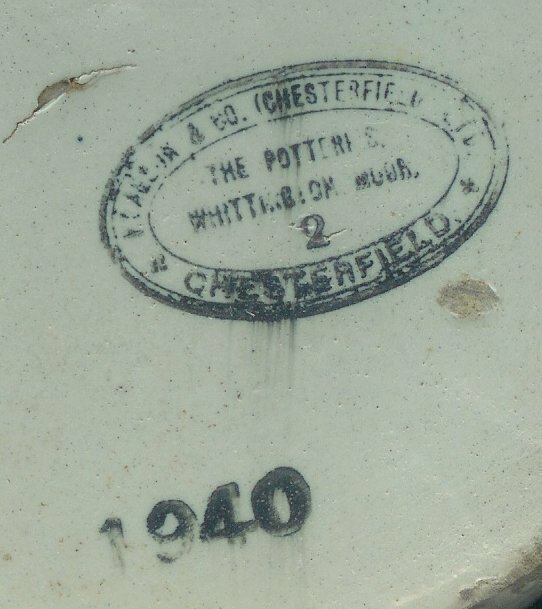 They used two marks with the potter wheel on it and it is still the same today. The very rough stamp on the SRD jars in WW1 is their most basic mark. Another one is impressed 'Skey - Tamsworth' but You already got that name. Would it be possible for you to do me a favour, take a couple of photos of the one with the handle by itself and pass it on? will take some time as I have no digital camera. Some 10 years ago I noticed a farmer removing earth with a bull dozer. 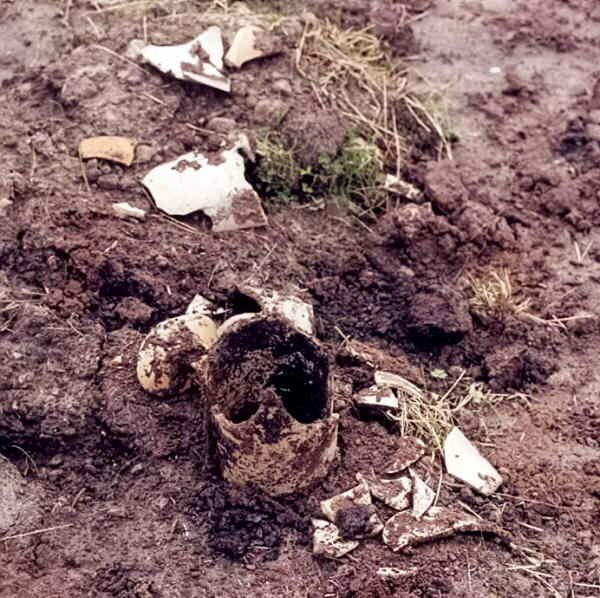 He had unearthed maybe 10 rum jars and had crushed them afterwards with his bull dozer. (see the result on pic) He showed not the slightest interest in the rum jars, that he certainly must have noticed. 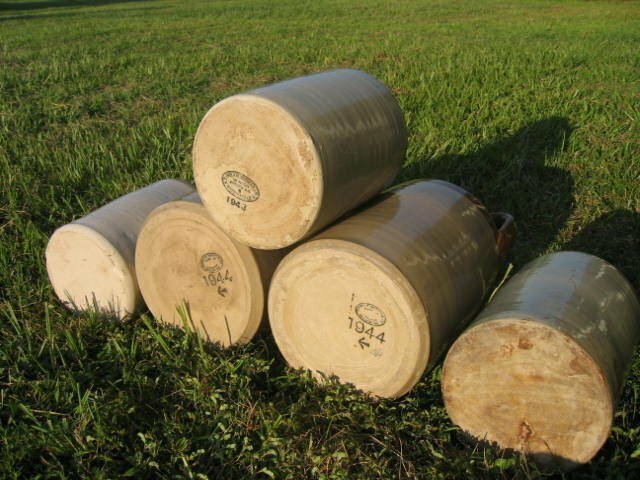 Another farmer told me once that they used to break jum jars for the necks that were used as isolators on electrified fences. I've not seen Bateson's before. Who made the 1/2 gallon on the right? This looks very like Dave's in the post below yours. Is the mark clear? Been lurking for a couple of months until I found a thread where I could add something. Here's my collection of rum jars. In the group shot the center 1 gallon is not SRD marked but I added it for the stamp on the bottom. All three ink stamped ones are Pearsons. 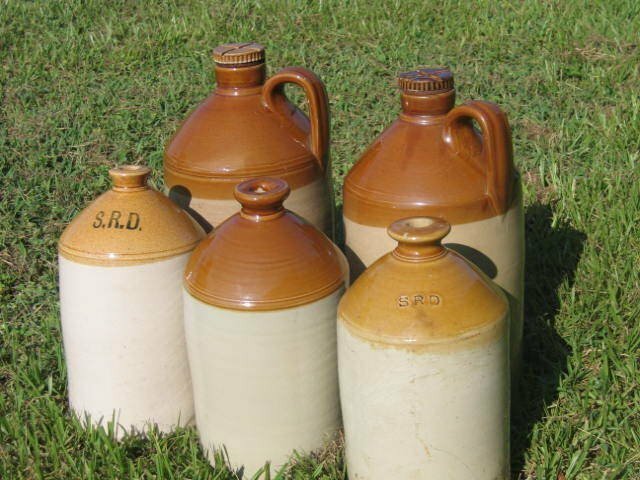 I have seen a two gallon that was dated 1945 in the same manner as the one in the picture but also carried the Crown between AM Air Ministry mark on the top, printed under glaze like the normal SRD mark. 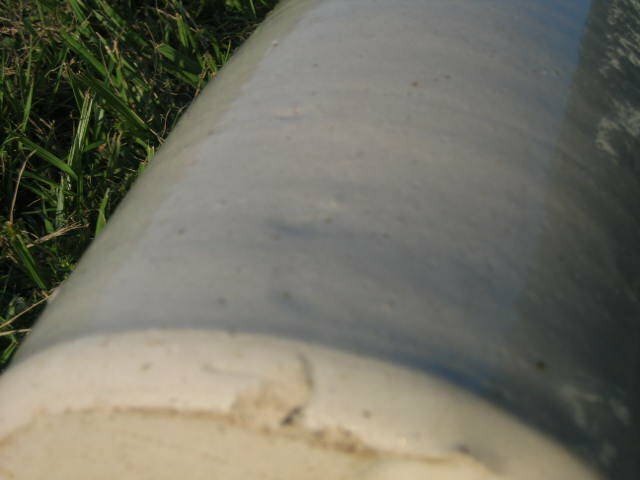 This is the printed SRD on the left in the first photo. It's one of the favorite pieces in my collection. 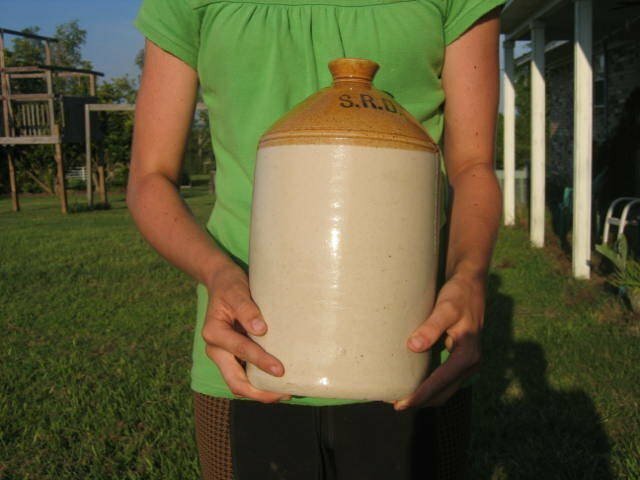 When you pick it up and hold it as my daughter is shown holding it you can feel the impressions left by whoever picked up the greenware crock. There are a couple of finger impressions on the bottom. 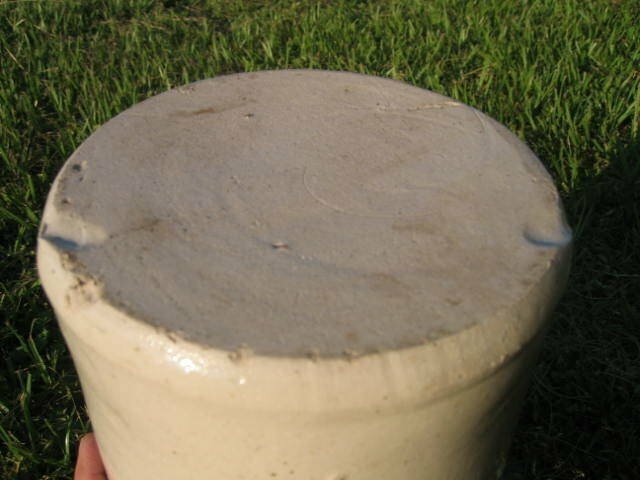 On the sides you can feel where their thumbs and the heel of their hand pressed the soft clay inwards. From the size of the impression it must have been a woman or child who picked up newly made crock, probably to carry it to the kiln. While we all have the "If only it could talk" thoughts about objects in our collections rarely does the person originally involved with a piece leave behind such a tangible reminder of their presence. I can never pick this up without wondering who they were and what became of them.